As the 'pictures' were beginning to be shown in the early 1920s at the new picture house on Main Street, villagers wishing to commemorate those who had given their lives in the First World War decided to build a Memorial Hall, rather than a war memorial. A fund was set up, but did not raise enough money. 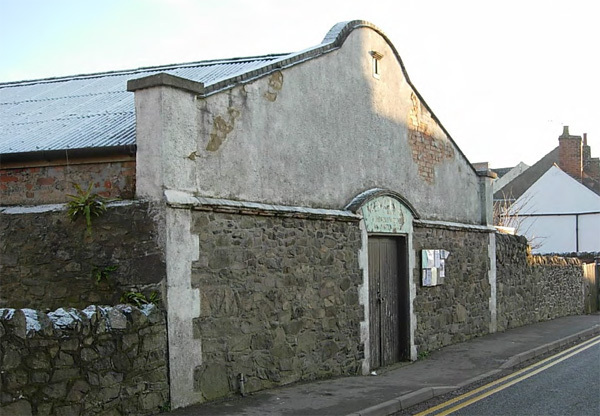 Eventually an amalgamation with the Miners' Welfare enabled the villagers to buy the picture house and adjacent land at 128 Main Street. The building became the 'Memorial and Miners Welfare Institute', dated 1925. It is pictured left below and the Institute page provides more details. When the new Community Centre opened in 1987, the Institute gradually fell into decline, eventually closed in the early 2000's and was demolished in 2018. Houses will be built on the site. In 2014, some 100 years on from the start of the First World War, a new war memorial to the fallen of the First and Second World Wars was established on The Green in front of the Parish Church. It replaces the Institute as the official village memorial and was paid for in part by the proceeds of the sale of the Institute. The names were selected by the history group using the various church lists and local documents, together with records now available on websites such as Ancestry. The group recognises that different views may exist as to some inclusions and exclusions. 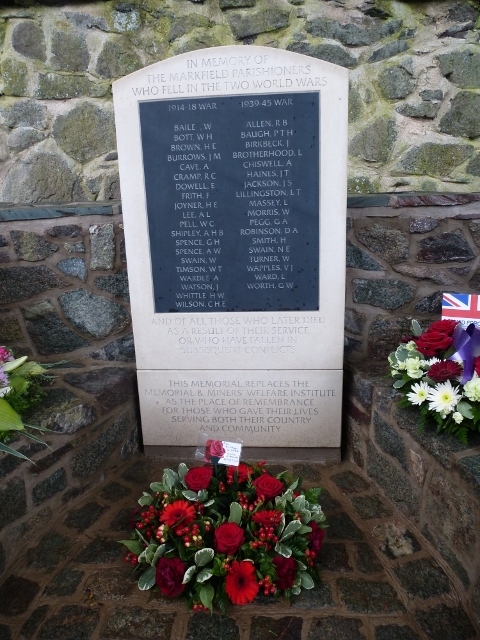 The new memorial was dedicated on Saturday 28th June 2014, at a service attended by relatives, religious leaders, civic dignitaries and villagers. It is pictured right below. The names are listed after the photos. In addition to the village war memorials, each Church keeps its own list of those killed in the two world wars. More details of the men killed in, or as a result of, WW1 are shown on the 'Men who died in WWI' page.